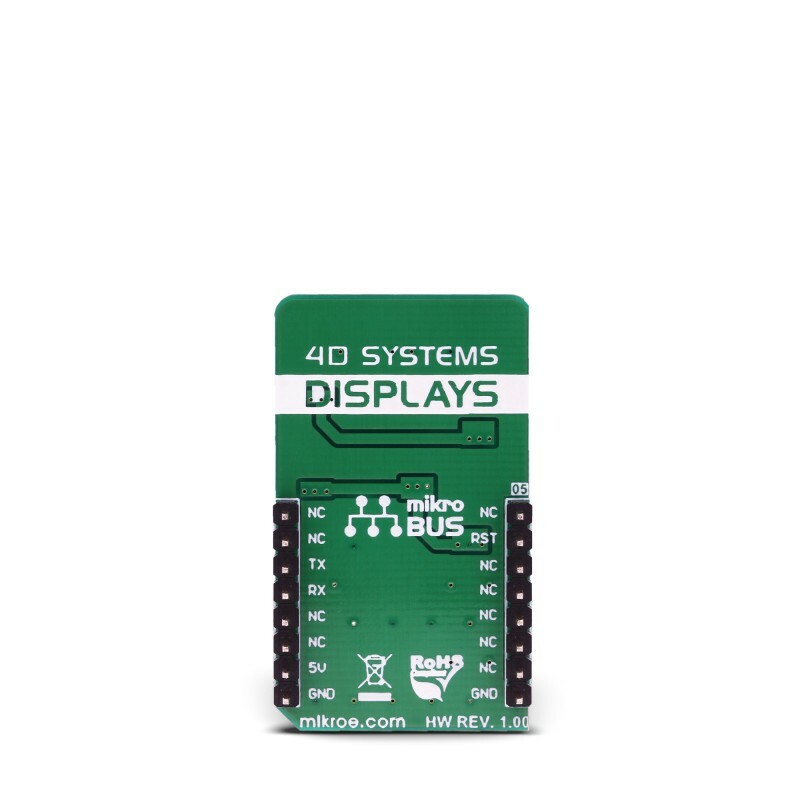 4D - display click is an adapter Click board™ that offers a mikroBUS™ interface for controlling 4D Systems gen4 Series intelligent Display Modules. 4D Systems designs and manufactures a wide range of Intelligent Display Modules equipped with powerful graphics processors. Their displays allow graphical objects control by exchanging specifically formatted messages with the external microcontroller (MCU) over the UART. 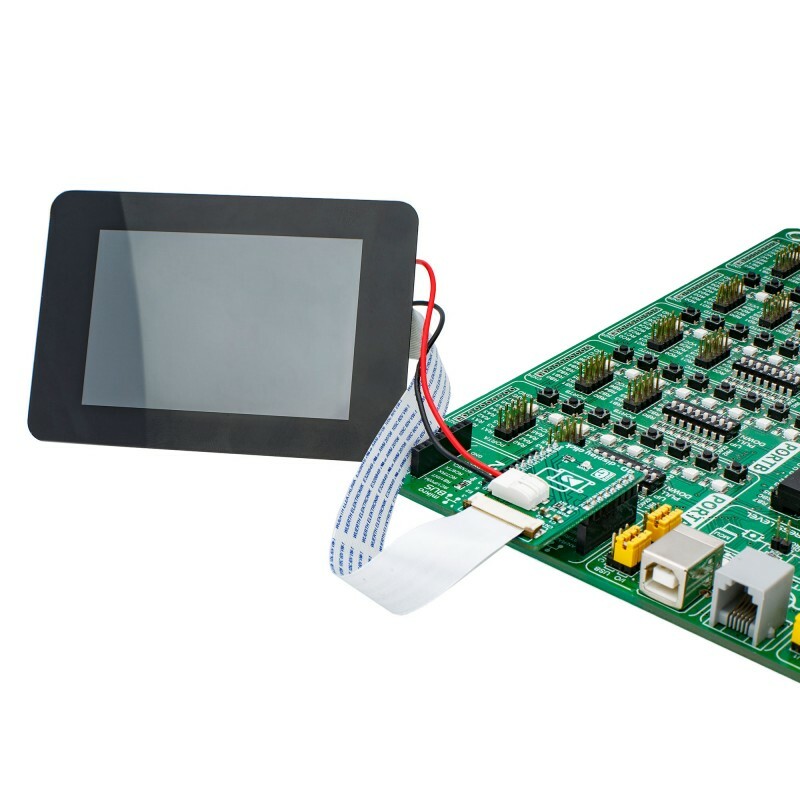 By utilizing the 4D - display click, it is possible to develop an MCU firmware application that can interact with the graphic objects on the 4D Intelligent Display Module over the mikroBUS™. This significantly simplifies the application design, while reducing the processing load on the host MCU, allowing amazing graphically based applications to be created, even with slower 8bit MCUs. TFT 4D - display click offers a high quality 30-pin ZIF FFC connector for display connection, as well as a 2-pole SMD terminal block for connecting an external power supply, for cases when the connected display demands more power than the mikroBUS™ is able to provide. A small SMD jumper is used to select the external power supply source in this case. 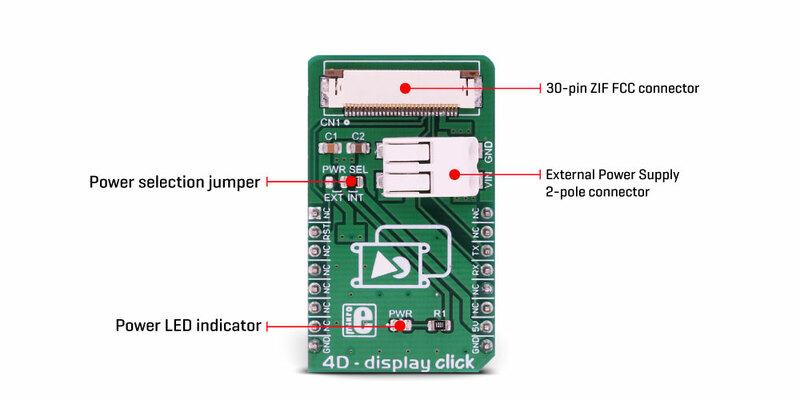 This Click board™ offers a reliable and fast UART connection between the 4D intelligent display and the development system, allowing any system equipped with the mikroBUS™ to harness the graphical power of the 4D intelligent display. 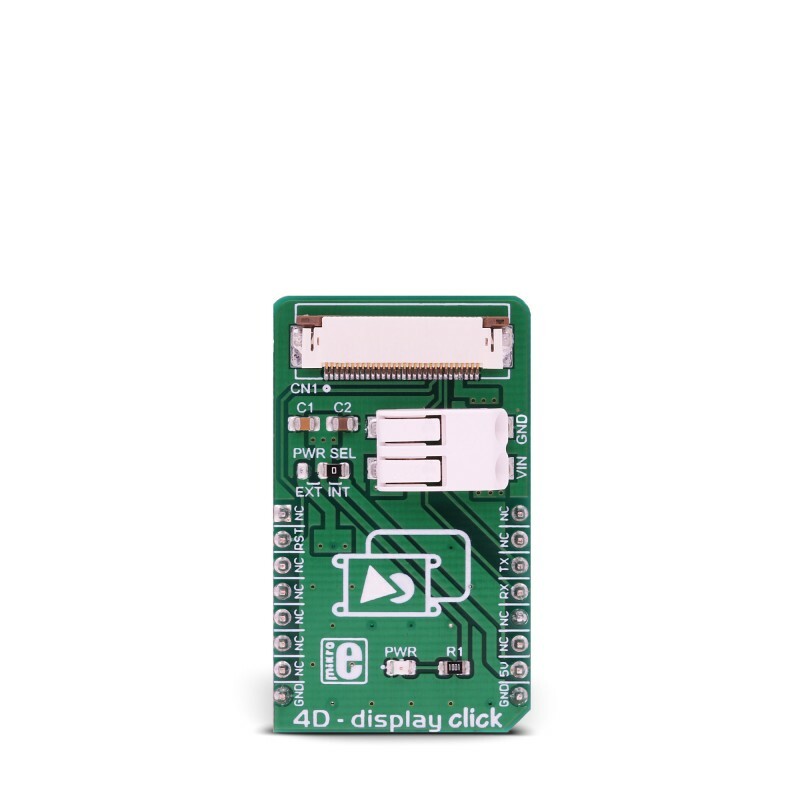 4D - display click is an adapter Click board™, used to interface gen4 intelligent display modules produced by 4D Systems, with the MCU systems equipped with the mikroBUS™ socket. 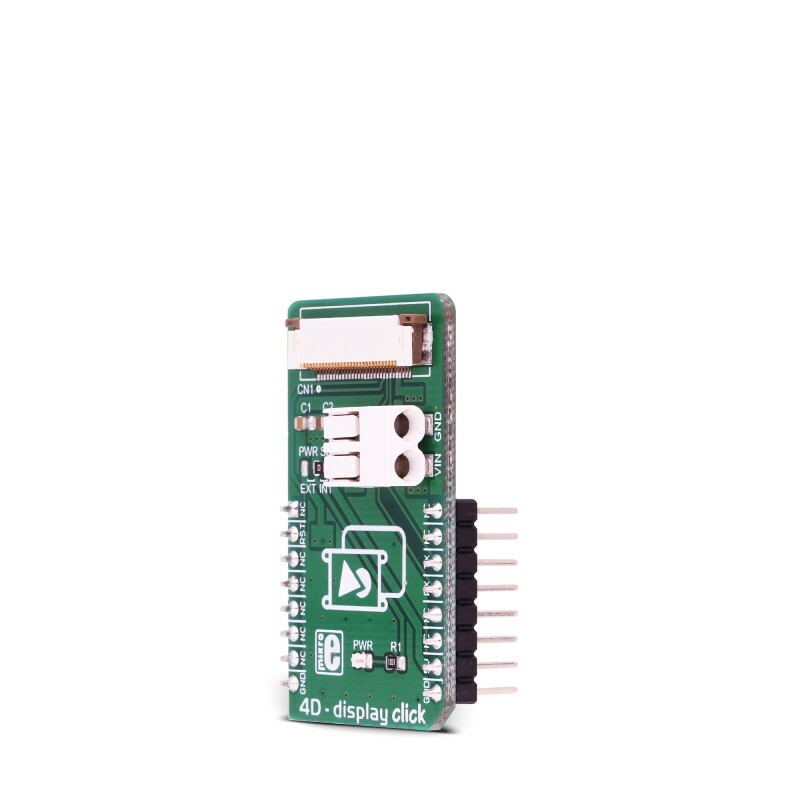 The Click board™ is equipped with a high quality 30-pin ZIF FFC connector, which allows reliable and secure connection with the intelligent display module. The gen4 intelligent display modules are equipped with the powerful DIABLO 16 graphic processors from 4D Labs, which are used to accelerate graphic processing. The gen4 display module product family offers ZIF FFC connection interface, so these displays can be used with 4D - display click. By utilizing the proprietary software IDE called 4D Workshop4, it is possible to build accelerated graphic objects on these displays, each with its unique ID, type and value. This information can be exchanged with the smart display module over the UART. This is where 4D - display click adapter comes in handy: by connecting the previously programmed intelligent display module to this Click board™, an interaction between the MCU running a custom firmware and the display itself is made possible. For example, it is possible to read the ambient light data provided by the UV 4 click installed in the mikroBUS™ socket 2, while showing it on a gauge displayed at the screen of the intelligent display module, connected to the 4D - display click on the mikroBUS™ socket 1. By transmitting the UART data that contains the unique ID of the gauge object and the light intensity reading in the place of the value parameter, the intelligent display will automatically move the gauge scale to show the new updated value. The communication in other direction is possible, too: touching a pre-programmed button can perform an action on the host MCU, which will receive the UART message from the smart display, containing the unique ID of the button object and its pressed state. More information about 4D intelligent display modules and the software IDE used to program them, can be found on the official site of the 4D Systems. This table shows how the pinout on 4D - display click corresponds to the pinout on the mikroBUS™ socket (the latter shown in the two middle columns). We provide a demo application for 4D - display click on our Libstock page, as well as a demo application (example), developed using MikroElektronika compilers. The demo can run on all the main MikroElektronika development boards. Library performs the control of the 4D Systems LCD displays via UART interface by sending the determined commands. The commands can read the objects and write the desired value to the objects, also they support sending the report from the device to the host. Before we start to use this library, first we must perform the LCD display programming. The UART baud rate on LCD and UART baud rate on the host device must be the same. The user can use our demo application for the 4D Systems LCD display, which simulates the speed measurement. For more details check the documentation. void c4d_writeObj( T_C4D_OBJ_P obj ) - Function writes the desired value to the desired object. void c4d_readObj( T_C4D_OBJ_P obj ) - Function reads the value of the desired object. uint8_t c4d_sendCommand( uint8_t _command, uint8_t *dataIn, uint8_t nBytes ) - Function sends command to the display. Application Initialization - Initializes UART driver, configures timer and puts all objects on the display to the inactive state (initializes display). Also waits about 5 seconds to stabilize the display. to control all objects on the display. Timer interrupt function is used to control the slider object value and on that way we simulate the speed changing.